On this date in 1960, Manfred Smolka was guillotined in Leipzig. Smolka was among three million East Germans or more who escaped over the border to West Germany in the 16 years after the defeat of the Nazis divided the country. In the earliest years, people sluiced over the long border just anywhere. By Smolka’s time, that perimeter was buffered by an “internal border” that made it difficult for ordinary people to approach near enough to West Germany to escape. Consequently, most emigration by the the late 1950s occurred in the divided city of Berlin — a flow that East Germany would finally stanch in 1961 with the ultimate in immigration reform, the Berlin Wall. 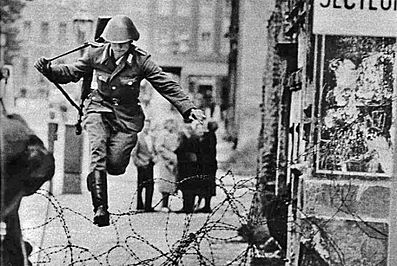 One of the Cold War’s iconic photographs: East Berlin border guard Conrad Schumann leaps over the barbed-wire barrier into West Berlin on Aug. 15, 1961, just days after construction of the Berlin Wall began. The very next year, he arranged to meet his abandoned wife and daughter on the Bavaria-Thuringia frontier to smuggle them over, too. Alas, it was a trap (pdf) laid by the feared East German secret police, the Stasi. 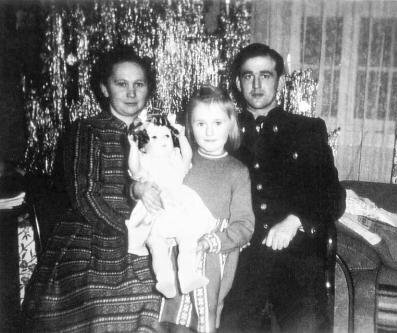 Happier times: Manfred Smolka with his wife and child. West Germans were outraged by Smolka’s capture and subsequent death sentence for “military espionage,” but the case was deemed an apt one for the education of East Germany’s border security agents. Only with post-Cold War German reunification could his family examine his file. “I am innocent, I can prove it a hundred times,” they read in the last letter the onetime defector wrote to his family — a letter which had never been delivered. “You need not be ashamed of me.” In 1993, a reunified, post-Cold War Germany officially agreed and posthumously rehabilitated Manfred Smolka. There’s a few minutes of documentary video about him, in German, here. * By a July 5, 1960 account in the London Times, Smolka was shot at and wounded as he crossed into East Germany but still managed to “crawl” back to West Germany — where his pursuers did not fear to follow him.